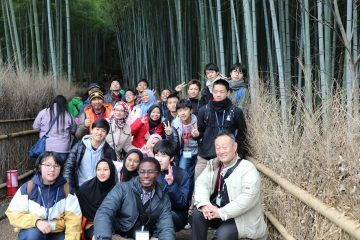 A trip to Kyoto with students from OISCA Malaysia High School! 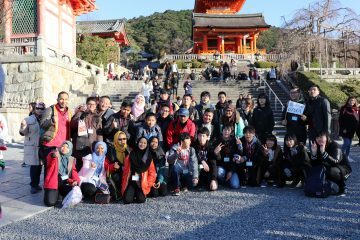 On Saturday February 15th, 18 students and five teachers from OISCA Malaysia High School joined 16 of our First and Second Years, along with our exchange students Matthew and Miki, on a sightseeing bus trip to Kyoto. In each group, there were two Malaysians and two Nose HS students. The groups walked around one by one, and our students gave the visitors a guided tour in English. In the morning, we had a walk around Arashiyama. We went from Togetsukyo Bridge to the bambo forest, stopping by Nonomiya Shrine along the way. The Malaysian students got to experience a traditional Japanese shrine visit, including prayers and the ritual cleansing with water on the way in. Islam also has a purification ritual before prayers, so they seemed quite comfortable with this. After the shrine, we strolled through the bamboo forest, and were quite overwhelmed by its picturesque beauty. We then followed the Hozugawa riverside back to Togetsukyo Bridge, where we returned to the bus. For lunch, we had halal onigiri – a take on a Japanese tradition which seemed quite unusual to them as they stuffed their cheeks! In the afternoon, we went between Chion-in and Kiyomizu-dera Temples. On the way, when the time came for afternoon prayers, we dropped by a Halal ramen restaurant near Chion-in by the name of Naritaya. 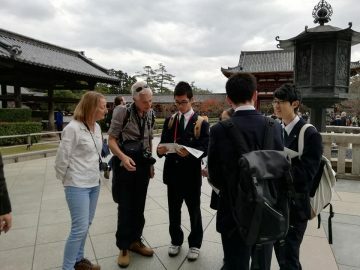 After finishing up in the restaurant’s prayer room, they reconvened with the Nose HS students in front of the temple, and they set off in groups up Ninenzaka and Sannenzaka Slopes towards Kiyomizu-dera. While walking the quaint streets of the area, they stopped off to buy souvenirs and eat matcha ice cream in a swell of cultural exchange. Every student enjoyed their day in the old capital. 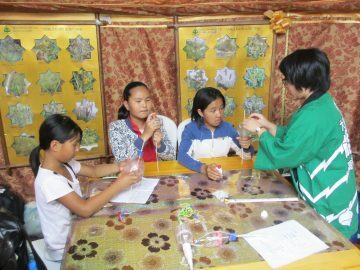 For the Malaysians, it was a chance to experience Japanese culture first-hand. For our students, it provided an opportunity to try halal food, and feel a little more familiar with the culture of Islam and its prayers. We hope that this experience of cross-cultural exchange and multicultural symbiosis will prove valuable for them all. Kaofang, our Thai exchange student and friend, left Nose recently. He has been studying alongside our Second Year students for around a year, staying with a local household and commuting to school from there every day. 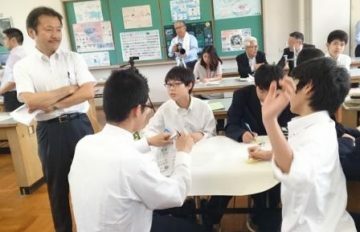 Besides taking the same classes as the Japanese students, he has been eagerly studying Japanese with support from local Japanese-language volunteers. He was also one of the participants in the SGH classes. His interest in Japanese culture extended to club activities as well; he enjoyed karate, tea ceremony, flower arrangement, and calligraphy. 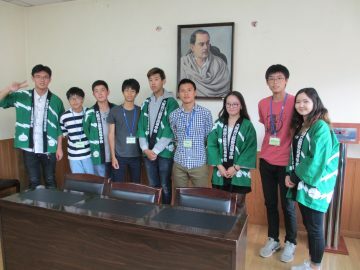 He also joined English language sessions at Nose Elementary and Middle School, gave many presentations about Thailand, and joined the school trip to Malaysia with the Second Year students at the end of January. He has been much loved by the people of Nose, as shown by the number of students, teachers, and family members who travelled all the way to see him off at the airport. We hope he will come to visit Nose again in the future! Thanks, Kaofang, and goodbye! The Second Year’s school trip to Malaysia is coming soon. In preparation for the visit to Assunta High School, three of our Second Year students have been learning a traditional art with a professional in the form. 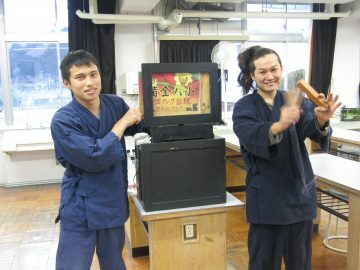 They are learning kamishibai, a traditional paperboard storytelling show popular in the lean years of the mid-20th century before the advent of television. They are being taught by Dammaru, a kamishibai storyteller of the theatrical troupe Yassan. On 14th December, they had the opportunity to watch him perform at his kamishibai showroom in Kyoto International Manga Museum. 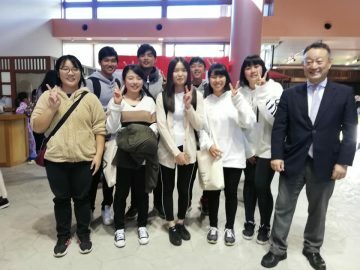 From 26th to 27th December, three of our First Year students travelled to Toba city, Mie Prefecture, to attend the 2018 Regional Creativity Summit. 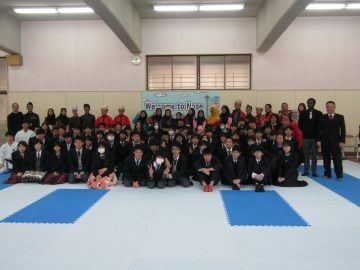 Participants came not just from around Mie, but as far away as Okayama, Ehime, and Hiroshima. It was our second time to attend following last year. Participants were divided into groups to conduct fieldwork, take part in discussions, and suggest policies in presentations which were to be performed for the mayor of Toba City at the end of the summit. We learned about many different issues in different areas of Japan, which we hope will serve to broaden our students’ knowledge beyond situations local to Nose. On Tuesday 18th December, we held the Second Year’s 36th SG focused-area lecture. 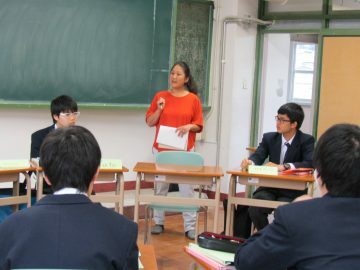 This session was a continuation of the November lecture by Kaori Hamaguchi of Mother House, whom we welcomed back to Nose HS. That lecture was entitled “Learning from brand creation in a developing country: going beyond Fair Trade”. This time, we were joined as well by Kento Fujisawa, manager of Mother House’s Mint Kobe branch. 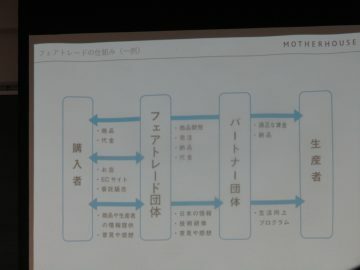 Ms Hamaguchi started the session with a review of the previous lecture, before handing over to Mr Fujisawa, who talked about his motives for working at Mother House. When he was in the third year of high school, he told us, he read a special feature in the economics magazine Nikkei Business Associe. The feature was about the founder of Mother House, Eriko Yamaguchi. He was deeply inspired by the fact that there is another way of international cooperation besides volunteerism and bilateral and multi-lateral aid. 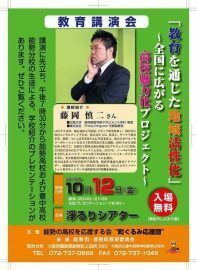 He soon became aware of “social enterprise” as a career choice, and went on to study Social Entrepreneurship at the Social Welfare Department of Kwansei Gakuin University. After graduating, and working for a while in other fields to gain experience, he achieved his initial goal of joining Mother House in 2013, where he now works as manager of the Mint Kobe branch. After Mr Fujisawa’s talk, we watched a video about Mother House’s factory in Bangladesh, which is called Matrighor. The video showed us situations where the factory workers and managers work together in cooperation towards a common goal. The factory was established by Eriko Yamaguchi in 2007, and through various processes, has grown to employ a total of 230 members of staff today. In the second half of the lecture, we made a Skype call to Mamun, the head of the Matrighor factory in Bangladesh. Before the call, the students split into groups to prepare questions. We tried to ask questions in our own English, but when the conversation became a little too complex we relied on Ms Hamaguchi to interpret for us. We were able to speak to Mamun for 30 minutes, and he answered every one of our questions with the utmost grace and politeness. This lecture was the final SGH session of the 2nd Term, and provided a fine and memorable way for us to finish. On the morning of Thursday 6th December, we were delighted to welcome as lecturer Jun Kukita, former Unicef representative and current professor at Kwansei Gakuin University. 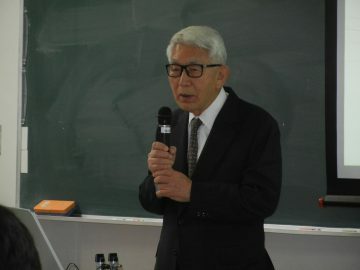 The theme of Professor Kukita’s address was “Unicef’s Global Problem-Solving Method: Living wise for the sake of the planet”. 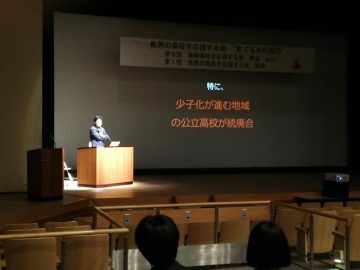 In the first half of the lecture, Prof Kukita talked about how we can live a life full of positive contributions to the future of the earth as we move into “the era of the hundred-year life”. The professor worked for the UN in six countries including Bangladesh and East Timor, providing aid and support activities. Now, having taken a teaching job, he is thinking about what he can do next to further still his contribution to the world. He had not even been considering this kind of thing when he was in high school, and he wanted to stress to us that as long as you have a mind to set goals for yourself, then you can accomplish these goals. In the second half of the lecture, he explained in detail the UN’s Sustainable Development Goals initiative (SDGs). The money-centred capitalist industrial society of the 20th century has brought about various problems with regards to wealth disparity and societal stratification. In order to face these issues, the UN introduced their Millennium Development Goals for the period between the years 2000 and 2015. These eight goals were aimed at redressing societal imbalances in developing countries with high levels of poverty. However, with today’s climate of unease and fear concerning the environment, conflict, the global economy, and resource shortages, the 17 goals of the SDG initiative were drawn up in an integrated approach to tackling these problems not only in developing countries, but in developed countries too, so that no one person will be left behind. 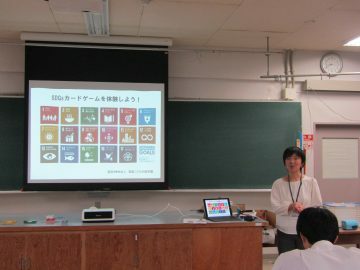 Finally, in order to demonstrate the practical use of SDGs in resolving the world’s problems, Prof Kukita left us with some useful guidelines: “Encouraging reform without being held back by the value system of the 20th century”; “Finding local solutions to global issues”; and “Doing what you can do yourself while striving for change”. We hope that the students will take the chance to perceive all they’ve learned about the SDG initiatives and the ways of thinking surrounding them to further their own ways of thinking moving forward. For the Second Year’s 7th SG basic knowledge lecture on Wednesday 5th December, We welcomed Mr Ryohei Tobayama of the Minoh Association for Global Awareness to talk about cross-cultural understanding and the symbiosis of multiple cultures. This seemed to leave an impression on our students. Mr Tobayama told us that these maxims originate from when he was in his teens and 20s. He went to neither primary nor secondary school. Although he moved to Taiwan with a job he found through Hello Work (the Japanese government’s Employment Service Centre), he did not speak any of the local language, nor indeed English. While working in Taiwan he went to an English language school, where he realised he enjoys studying and learning new things. Therefore, at the age of 30, he decided to go to a university. 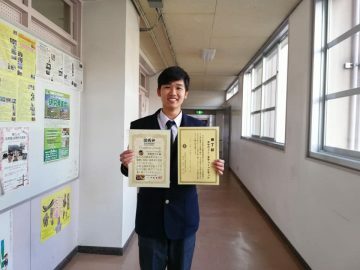 He found time around his job to study and prepare, and succeeding in winning a place on the Thai language course at Osaka University’s School of Foreign Studies. It was the first time in his life that he could feel pride in his own achievements from the bottom of his heart. His lesson was that we are naturally exposed to the influences of people and the environment surrounding us, but that it is we ourselves who make the final decision; therefore, it is vital that we are able to think about how to make a decision and on what to base it, while realising that respecting others’ ideas and diversity will also help to create better decisions. Mr Tobayama, who had struggled with a lack of academic achievements but kept searching for his passion and strength was simply an inspiration for our high school students who are soon to make decisions that will alter their whole lives. 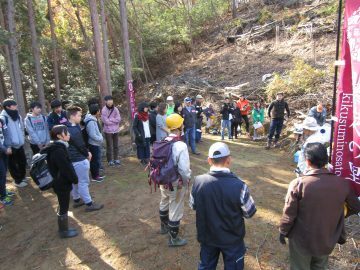 On Sunday 2nd December, five First Year students from the Global Studies research project lecture, 11 Second Year students from the Super Global basic knowledge lecture, and the Australian exchange students Matthew and Miki took part in satoyama preservation fieldwork. Satoyama refers to an area where arable land meets the foothills of the mountains. 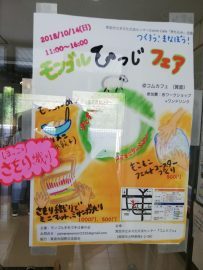 The activities were held by Nose Satoyama Creation Centre and located in “Kikusumi no Sato” (a creation space for the traditional art of chrysanthemum-patterned charcoal). This fieldwork forms a practical part of our SGH studies. The director of the Creation Centre, Mr Yoshitaka Kotani, began by explaining the role of kikusumi, particularly in regards to tea ceremony. 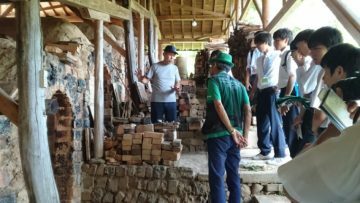 In front of the kiln, students learned that this charcoal from Nose contributes towards cultivating traditional Japanese culture. We then moved to Arakidani, a nearby site with a satoyama environment. 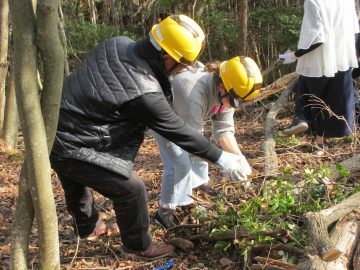 There, we cut bushes on the slopes to prepare the soil for planting Japanese oak seedlings, the raw material for kikusumi. The trees will be planted this coming February. 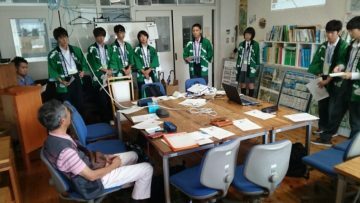 We also interviewed the ‘Samurai of the Mountain’, members of a self-established social club focussing on kikusumi and the preservation of the environment for its creation. We asked about their motivation, the importance of their activities, and their expectations for today’s youth. Finally, the ‘Samurai’ showed us how to make small Christmas trees from the local oak. This fieldwork demonstrated a highly sustainable utilisation of natural resources in action – something that we have learned is crucial for rural revitalisation. This game was useful, and let students consider how to truly recognise and begin to solve the issues facing global society. 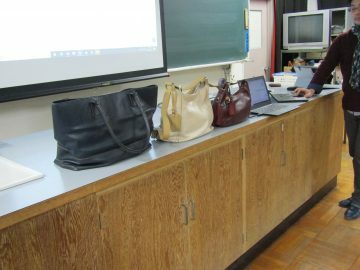 Wednesday 29th November saw the Second Years’ 34th SG focused-area lecture, delivered by Ms Kaori Hamaguchi, manager of the Tsutaya Bookstore branch of Mother House, a brand producing quality leather bags in Bangladesh. Ms Hamaguchi, who joined Mother House in 2012, previously worked in development in Nepal as a participant of the JICA youth volunteer scheme, and then in the JICA Nepal office. To begin, she introduced us to the brand she works for. Their production policy states that the quality of the bags and apparel goods made in developing countries could and should satisfy consumers in developed countries such as Japan and Hong Kong, and that this can help to improve social issues in the countries of production. Mother House is characterised by the mutual communication between producers and consumers. We watched a video about how the goods sold at Mother House stores are produced with sincerity in a vibrant atmosphere under the instruction of Mother House staff. After the talk, our school’s students and our exchange students split into four groups, and asked questions regarding the differences between conventional fair trade mechanisms and the one employed at Mother House. These aspects of Mother House’s global outreach made our students consider what businesses can contribute towards social issues. 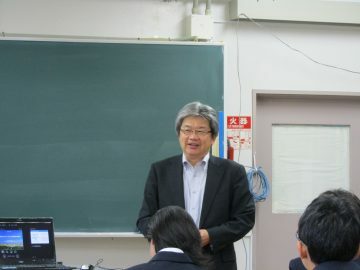 On 28th November, Mr Katsuhiko Ogino, the director of the Minoh Association for Global Awareness, delivered the Second Year’s 6th SG basic knowledge lecture. The theme was human rights in a multi-racial nation and the racial issues of the USA. As Mr Ogino worked in the US for 6 years, he has first-hand experience of issues surrounding discrimination and employment that face a multi-racial country, and understands the difference between the situations in the US and Japan. The point he emphasised is that we must respect and hear the ideas of others. He gave examples of cultural differences such as equality versus respectfulness in a relationship, religion, cleanliness (e.g. taking off shoes in the house), and the acceptability of being late for an appointment. Our ‘normal’ is never the same once we step out of the country, and there is no absolute right. Accepting the differences and respecting each other is the key to coexisting with people from diverse backgrounds. For the First Year’s 11th GS project research introduction lecture on Wednesday 21st November, we were delighted to welcome back Mr Kotaro Kawamata, chief of Environmental Planning at Japan’s Ministry of the Environment and former consul at the Japanese Embassy in Germany. 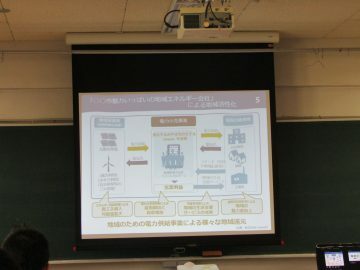 The theme of his last lecture in May was the German-model community reinvigoration and energy source conversion by an energy company local to our school. Based on the fact that Nose Town spends 2 billion yen per year to ensure that we have enough energy, and that this eventually leads the money draining out of the country, Mr Kawamata emphasised the importance of sustainable and renewable energy utilisation. After his lecture, we discussed what kind of renewable energy is suitable for Nose, and what we as residents and students can do. Mr Kawamata recommended that we start with small things, and that even thinking about how to start is an important first step. The knowledge from this lecture and workshop should help us in our upcoming collaborative topic research with Germany’s Brilon High School. 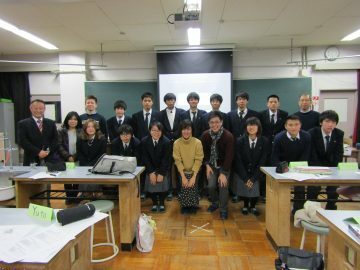 In the SGS class on Tuesday 20th November, we were pleased to have Prof Noriko Yamano of Osaka Prefectural University to host a public lecture in collaboration with Nose Municipal Education Committee’s Lifelong Education Division. 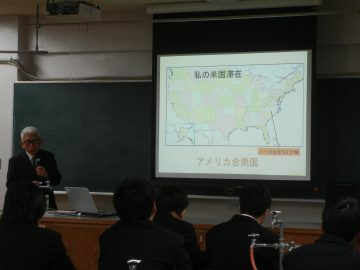 The aim of the lecture was to encourage high school students to think about local issues. We had a considerable of visitors from outside of the school in the audience. 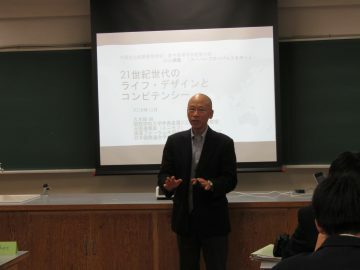 Prof Yamano started the class with a lecture about child poverty as an issue in Japan generally and Nose specifically. Our students’ presentations followed; they delivered their research from the overseas and domestic trips on the topics of poverty, education, and gender. The latter half of the class was spent on a workshop letting us think about how to revitalise Nose, facilitated by staff from the Lifelong Education Division. 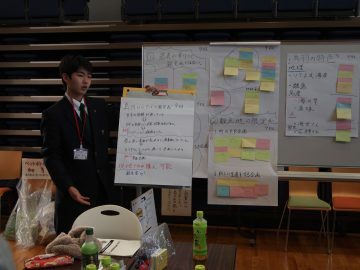 Students and local residents sat together, discussed issues together, and presented together, all towards a common purpose: creating a better Nose for the future. 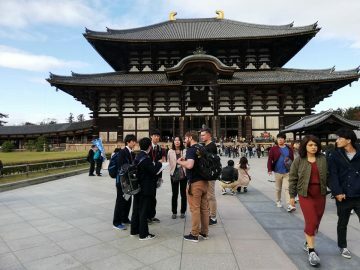 On Saturday 17th November, First Year students from the Global Studies research project lecture and Second Years from Super Global basic knowledge lecture attended a “Tourism Interpretation” workshop at Todaiji Temple in Nara. 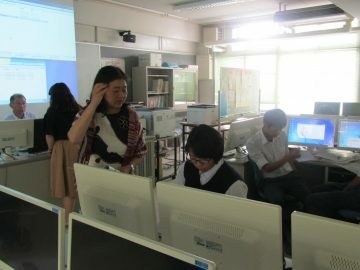 The workshop was hosted by Osaka International University, with whom our school has a collaborative relationship. In the morning, we were joined by OIU lecturer Roger and some of his students. 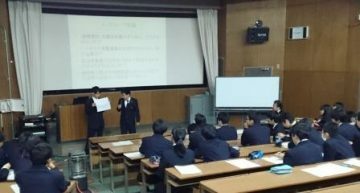 After a small lecture about useful English phrases and tips for introducing Todaiji Temple and its history, we made groups of two to three students from Nose and one to two students from OIU, introduced ourselves, and assigned roles. Finally, we were ready to volunteer as tour guides! 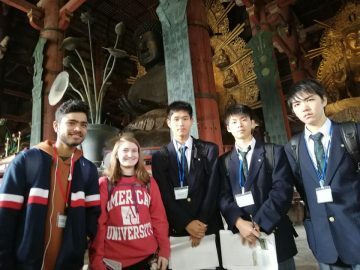 The afternoon was dedicated to challenging ourselves to act as English-language guides in Daibutsu-den, the gigantic building which houses the Todaiji Great Buddha statue. Each student group guided four or five international tourist groups from a range of countries, including Taiwan, Mexico, the USA, Greece, Poland, England, Australia, Italy, Germany, Spain, Sweden, Switzerland, Russia, Pakistan, and Israel. 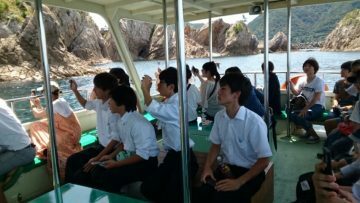 After guiding the tourists, students asked about their impressions of Japan and their motivations for visiting. This workshop was a great opportunity for students to try some real-life language production using what they have studied in the SGH classes. For the First Year’s 10th GS project research introduction lecture on Thursday 8th November, we welcomed Mr Tatsushi Isobe, CEO of Miyama Smart Energy, to present on Stadtwerke-style rural revitalisation in Japan. This was the second in our series of lectures on SDGs in collaboration with Nose Town Hall, with the goal of inspiring thoughts about the vitalisation of our town. Miyama Smart Energy, located in Miyama City, Fukuoka Prefecture, has adopted the model of Stadtwerke used in Germany: a public-interest company subsidised by the local government. 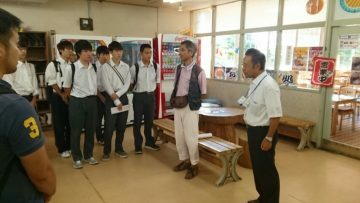 The company tries to revitalise the area around Miyama with businesses such as generating and consuming electricity locally, monitoring services for households of the elderly, delivering groceries, and running a restaurant. The main purpose of the company is to build sustainability and cooperation in the local community. Our first year students are working on the Nose revitalisation plan based on the idea of the Stadtwerke model. Mr Isobe encouraged them to become the central power of the movement. For the SGS classes on Thursday 8th November, we held the second year’s 3rd SG basic knowledge lecture. We welcomed Mr and Mrs Saito, owners of Fair Trade Shop & Café Espero Nosé, to talk about the systems of fair-trade and its current state. The Saitos renovated a 100-year-old Japanese house in Nose by themselves, and relocated the fair trade store they had been running in Minoh there in 2017. Espero Nosé sells handmade bags, embroidery, and coffee beans from Bangladesh, Nepal, and parts of Africa. 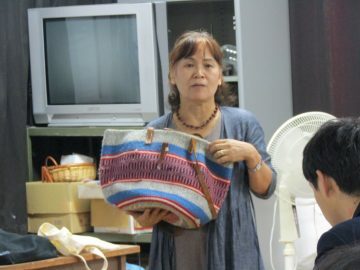 First, Ms Kazuko Saito lectured about fair trade, a trading system supporting the independency of supplier farmers in developing countries, who would otherwise lack power, by offering better trade conditions. Then Mr ‘Terry’ Saito talked how they founded Espero Nosé. They chose Nose because this rural town fits with their policy of contributing internationally from a rural area of Japan. 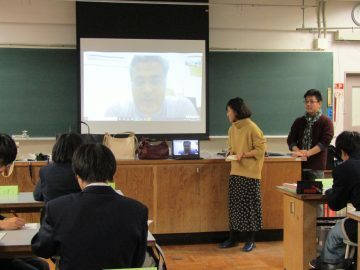 During the Q&A session at the end of the class, a student asked a question that will be useful for us: how should we sell handmade Mongolian products, like the ones that we saw on our trip there, at stores in Japan. The students are connecting what they have learnt from different places quite skilfully. We hope for many more connections moving forward! On Wednesday 7th November, we held the SGH mid-term presentation session as the first part of the integrated school system conference. The first presentation was made by 15 Second Year SGS class members, including our Thai exchange student Kaofang. It was the same English-language introduction to Nose Town that they presented in Mongolia. The overseas and domestic research trip presentations followed, along with a brief explanation about SDGs, the key topic of the presentations. 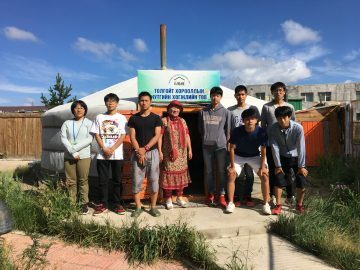 The students from the overseas trip talked about self-help based community building using the example of Mongolian poverty and homeless children. 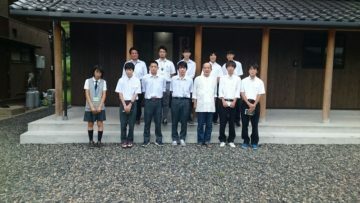 The domestic trip students talked about the possible application in Nose of rural revitalisation methods used in Tottori. Finally, four First Year GS class students presented on utilising the concept of Stadtwerke as the trigger for Nose’s revitalisation. We will have the term-end presentation session in February. Until then, our students will keep working on their research topics. On 3rd November, we went to Joruri Theatre to give a Javanese gamelan performance during the opening ceremony of Nose Town Cultural Festival. Gamelan is a type of traditional Indonesian music. 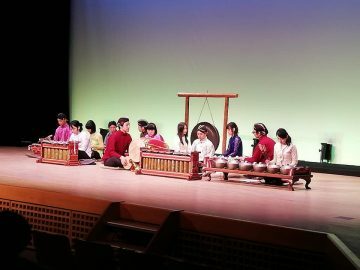 Our international performing group was comprised of six SG students from Japan, Khaofang from Thailand, Selina, an exchange student from Malaysia, and four members of MargaSari, a Gamelan group based in Toyono, the next town over from Nose. They practised extremely hard for this day, and were able to achieve something really special. The audience were unlikely to have heard the sound of gamelan before today, and they seemed very engaged in the performance. On Monday 29th October, Nose High School organised the first of three lecture series themed around sustainable rural development, in collaboration with Nose Town Hall. The purpose of this series is to consider Nose’s action plan for achieving SDGs. 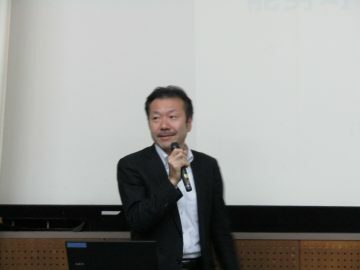 To that end, our first guest lecturer was Tomoki Ehara, CEO of an environmental sustainability organisation known as E-konzal. Mr Ehara talked about SDGs for citizens like us. Before Mr Ehara’s lecture, Mr Yadate, head of policy promotion at Nose Town Hall, gave a talk about the current tasks facing the town. He also discussed planned policies including independent electricity generation and renewable energy use. Mr Ehara, by talking about each of the 17 goals of SDGs, showed how the world is filled with unsustainable objects and behaviours. He explained in detail how Japan is contributing towards this unsustainability. For example, from an economic perspective, Japan is spending 20 trillion yen a year on importing unsustainable fossil fuels. This is a big bottleneck to the Japanese economy: 20 trillion yen is the same as what the country gains in exporting vehicles, electric devices, and machinery combined. 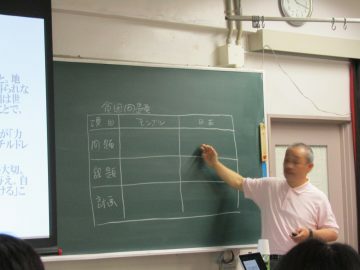 Mr Ehara argued that we need to renovate social consumption system around communities across Japan. Mr Ehara left us with a great maxim: the important thing in achieving social good – along with SDGs – is saying no to what we think is wrong. 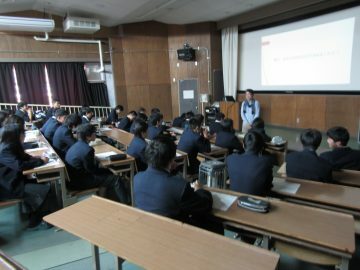 He stressed that this is a way in which even high school students can make a difference, by sending messages across a variety of channels. During the First Years’ 9th project research introduction lecture on Monday 29th October, we were treated to a presentation by Selina, a Malaysian exchange student staying with us for a short while. 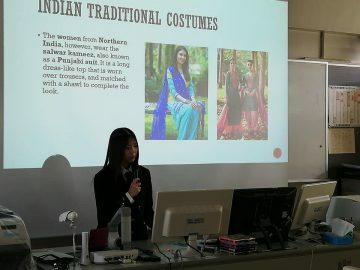 In her presentation, she introduced her multiracial country’s culture, religions, customs, fashion, and food. Though the presentation was delivered only in English, Selina is also able to speak Malay, Chinese, and Japanese. Our Second Years will visit Malaysia for their school trip, so this was a great opportunity to prepare by learning about the country. Sadly, Selina will only be with us at Nose HS for a little longer. We hope her experiences here, including this presentation, will have helped her make the most of her visit. On Sunday 14th October, the “Mongolia Sheep Fair” was held at the Minoh Association For Global Association (MAFGA). Seven of our First Year SGS students participated, along with Selina, our exchange student from Malaysia. They built and exhibited a ger with the supervision of Prof Imaoka of Osaka University, who teaches our Second Year as an SGH lecturer. The ger, which was made at Nose HS, took the students one hour to build. 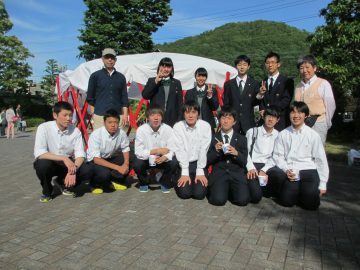 They also set up an exhibition in the ger about their study trips to Mongolia and Tottori prefecture. As well as Japanese people, we had many international visitors, with students guiding Mongolians, Americans, and Malaysians around the exhibition. 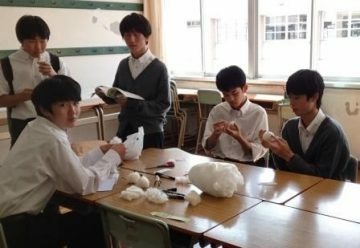 In addition, over in MAFGA’s main building, our students held a workshop in making sheep dolls using Mongolian wool. Twenty visitors attended to the workshop. Watching this activity, Shatar, a director of a Mongolian group in western Japan, was moved to invite us to a Mongolian festival on Saturday 10th November, which we are now planning to attend. 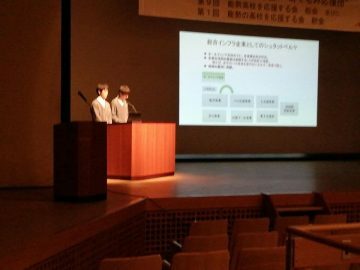 On Friday 12th October, two students from the First Year’s Global Study class gave a presentation at the general meeting of Nose HS supporters at Joruri Theatre. 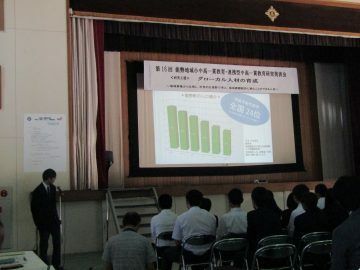 The presentation was about the use of renewable energy in Nose. 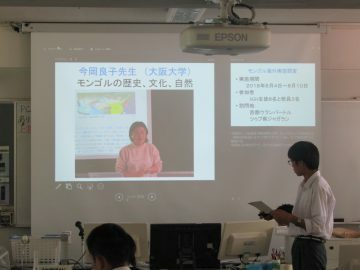 The presentation is part of the research project the students began after a guest lecture from Mr Kawamata, a counsellor of the Japanese embassy in Germany. He raised the question of whether Nose town can utilise the German system of Stadtwerke, or public utilities. 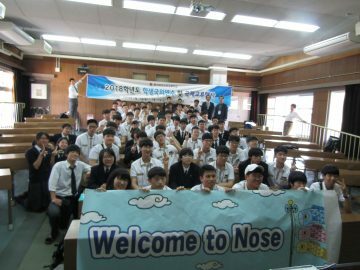 The students have done this presentation twice before, but it was the first time to have members of the Nose public as an audience. We hope the supporters of our high school will cooperate with us in carrying out next year’s study trip and field work in Brilon, Germany. Our students’ research continues; they will make a presentation on this research topic at the mid-term presentation session. In the early afternoon of Thursday 11th October, we were given a presentation by Khaofang – a long-term exchange student from Thailand – as the Third Year’s 3rd Super Global basic knowledge lecture. 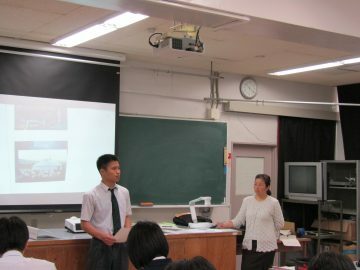 He started with an introduction of Thailand, and went on to talk about his life here at school and his first impressions of Japan. He touched on a few interesting topics, telling us that ‘555’ means ‘lol’ in online chat in Thai because the number five is pronounced ‘ha’, and that the formal name of Bangkok is the longest capital city name in the world. The class were very engaged, and asked a number of questions after his talk. Khaofang came to our school half a year ago. 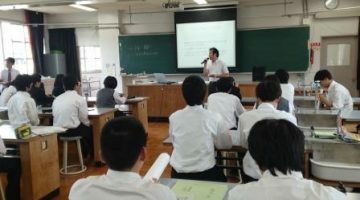 Everyone was surprised how much his command of Japanese has improved in that time, to the point that he can give a 30-minute presentation in purely Japanese. He is going to continue studying with the Second Years until the end of next February, joining the school trip to Malaysia in January as well. On Tuesday 2nd of October, the Second Year SG students gave presentations on their SGH research topics at our school festival. 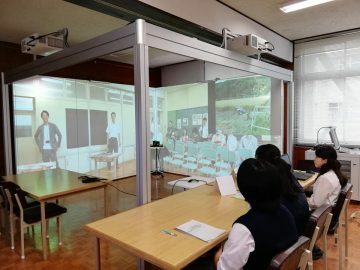 The date of the festival had been changed because of a typhoon, but this didn’t stop them from successfully delivering trouble-free presentations, They seemed to be nervous at the beginning, but they fought through those nerves. They talked about their August study trips, both overseas and domestic, including what they learnt from them and how they felt about the experiences they had. 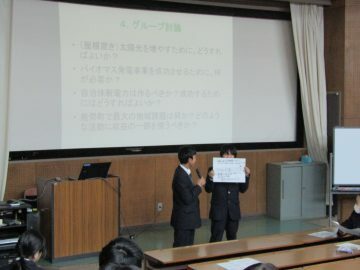 They will deliver an improved presentation on the same topic at the mid-term presentation session in November. Thursday 27th September’s SGS class saw the Second Year’s 24th SG focused-area lecture. 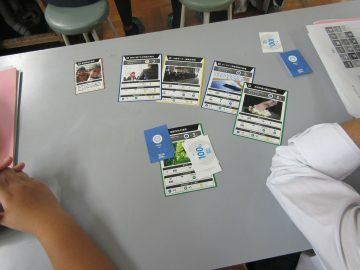 Based on what we learned last week with the SDG card game, we reviewed the process of SDG creation and adoption, including looking at the differences between the League of Nations and the United Nations, and MDGs, the previous international development goals which existed from 2000 to 2015. SDGs are developed based on MDGs, adding more focus on living with dignity. Then we learned Japan’s role and strategies regarding SDGs. We will think about how we can combine what we have learnt about SDGs with our experiences in Mongolia, Tottori and Nose to suggest and execute action plans. On Thursday 20th September, we held the Second Year’s 23rd SG focused-area lecture. We welcomed Ms Miho Fujita, the principal of Minoh Kodomo no Mori Gakuen Academy, to host the Sustainable Development Goal (SDG) card game. The SDGs, which were adopted at a UN Summit in 2015, have 17 main goals and 169 concrete targets on social issues. Those goals, set to secure human well-being, are intended to be achieved by the 193 UN member countries by 2030. In SGH classes this year, we have been thinking about what kind of activities related to SDGs we could do in Nose. The SDG card game is meant to convey applications of SDGs in situational cases. In the game, pairs of players aim for a goal they set themselves. It is difficult to keep a good balance in the game, as it is in reality. For example, if you have a good economy in the game, you might lose your good natural environment. Students struggled with this in the beginning. They gradually learned how to aim for the goals while creating a stable, liveable, environmentally-sound world. This game gave us a good insight into what the real world should aim for. The world will not improve if people think only of themselves. We also learned that the improvement of environmental issues takes a great deal of time and money. Through this game, our students learned who is able to help to achieve SDGs, and eventually change the world. Ms Fujita’s closing remarks left an impression on us all: “Each person has only a little power but it doesn’t mean the individual has no power”. To understand the process of making SDGs, student groups read seven UN treaties and conventions such as the Charter of the United Nations and Rio+20. Then, students analysed each document to figure out which text applies where with regards to SDGs, and discussed and presented their findings. They seemed to understand just how much time was spent and how many people were involved in the formation of SDGs. 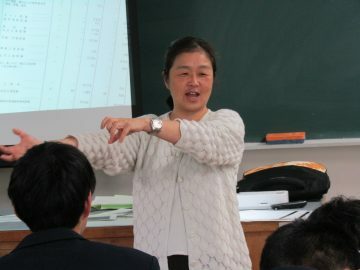 Ms Imaoka appreciated the students’ efforts in reading the abridged documents in such a short time and she encouraged them to have more confidence. Though it required a lot of effort to understand difficult documents in a short time, it was a very good introduction for SGH students to get ready for the SDG card game session in the class next week. 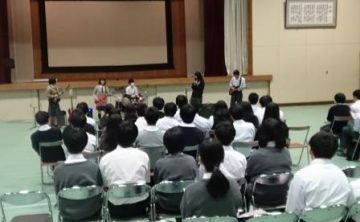 On Saturday 8th September, Nose High School students joined the Toyonaka High School festival through the remote network system ‘Smooth Space’. We started the session with a presentation on Mongolia by one of our SG groups, and spent the rest of the morning selling grape jam and black rice. Our student committee members introduced these foods – which are produced at Nose HS – to the PTA, and we were selling them today for charity to parents of Toyonaka HS students. All profits will be donated to Magic Land, a Mongolian child shelter run by an NGO. 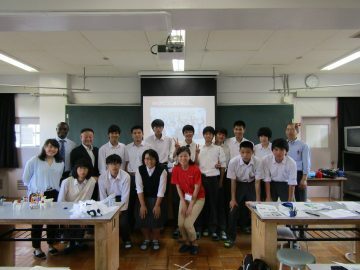 In the afternoon, the First Year GS participants had a presentation session with the Second Year students of Toyonaka HS. Our students delivered a presentation about utilisation of Stadtwerke for purposes such as rural vitalisation with renewable and biomass electricity generation. Stadtwerke is the German word for public utility. There was also time for discussion of the presentation topics. 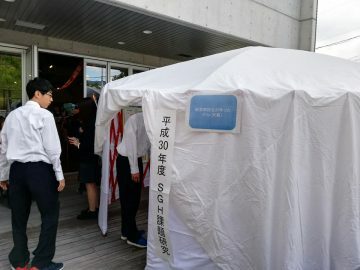 Joining the school festival, delivering a presentation, and selling charity products through Smooth Space was a new but successful trial for us. We are going to try out more methods of communication through this remote network system. For SGS classes on Thursday 6th September, we held the 21st SG focused-area lecture. This was the first lecture after the overseas and domestic research trips to Mongolia and Tottori, which were held in August. 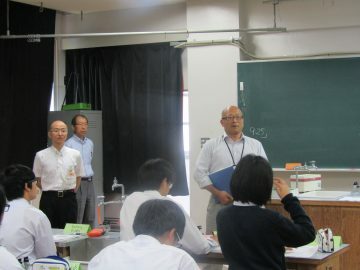 We were delighted to have Professor Imaoka of Osaka University with us to give feedback on the students’ presentations, which they had made over the two weeks since the trips. She pointed out that some groups were only reporting facts and simple impressions, and not giving any insight or analysis of their own. Based on the feedback, the students are going to polish their presentations for the mid-term presentation session in November. On Saturday 1st September, our Second Year SGS participants presented their reports on their overseas and domestic research trips. 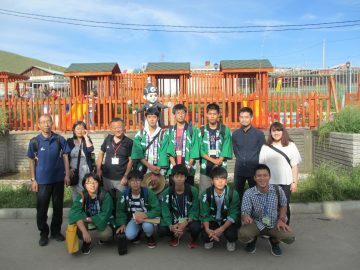 With the help of a number of photos, they discussed the purpose of their 10 research topics, travel details, and their opinions and impressions of the trips to Tottori and Mongolia. The six committee members left with good impression of their presentations. 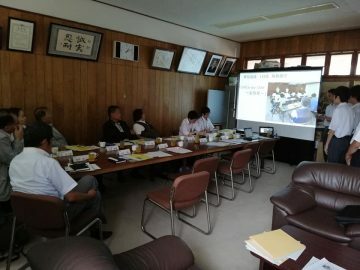 They appreciated, for example, the depth of the research achieved by interviewing people of influence in Tottori, such as Governor Hirai and the potter designated as a ‘human treasure’ of Japan. 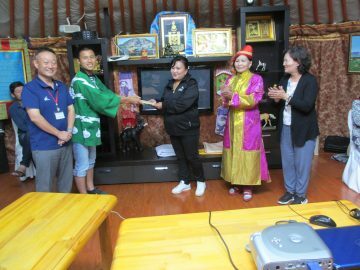 They praised the research opportunities arising from communication with NGOs, children, and residents of poor, non-touristic areas of Mongolia. They also said they are looking forward to watching the mid-term presentations on November 7th that will be based on this research. This presentation at the Committee encouraged and motivated the students in their preparations for that session. 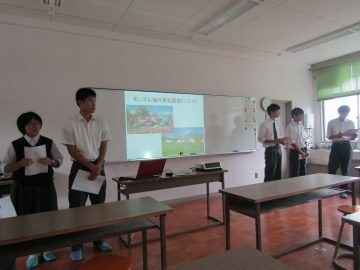 On 24th August, seven SGS students gave a presentation about SGH research classes and this year’s overseas study trip. 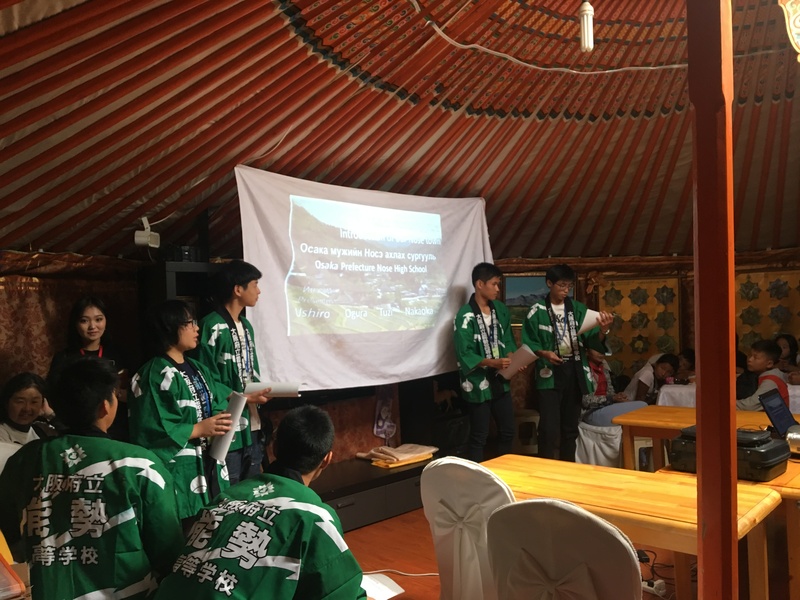 The students first explained the theme of this year’s research topic, “Building a self-sustaining society and mutual regional cooperation: a case study in Mongolian poverty and street children”. 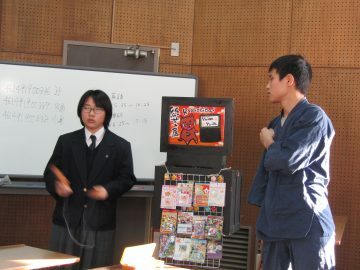 The students also discuss poverty amongst children in Japan. This was followed by a report of the overseas research trip to Mongolia, with a brief introduction to the purpose and results of the study, including the students’ visits to NGOs and national organisations. They also talked about specifics from the trip such as their personal impressions of the country, and things they experienced for the first time. The PTA members seemed to be interested in the SGH activities, and this was a fruitful session. In future SGH classes, the participants will summarise what they have learnt from the research trip in preparation for the SGH mid-term presentation in November. 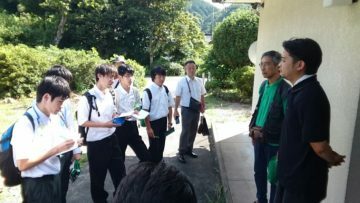 On 24th July, 12 Second Year students from the SGH lecture programme and 13 First Year students participating in the GS (Global Studies) lectures visited Tottori University of Environmental Studies. In the morning, the students met and talked with tutors from the English Village on campus. There were tutors from various countries; those present on the day were from Ethiopia, Sudan, Bangladesh, and the Philippines. Following the Second Year students’ English-language presentation on Nose, they had a fun time speaking English, and playing bingo, and some holding some discussion sessions. We had lunch at the cafeteria of the university, which is run by Sunaba Coffee. Sunaba literally means “sandy place”, a reference to Tottori’s famous dunes. The name is a pun on Sutaba, the Japanese abbreviation for Starbucks. 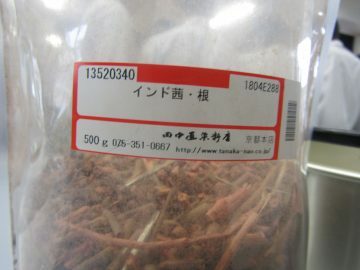 The brand was established by a local company after the governor of Tottori quipped “Tottori does not have any Sutaba, but is proud of its Sunaba”. The students enjoyed a big, delicious lunch at a good price. The five seminar students also gave presentations, and the seminar was rounded off with Prof Nakahashi’s mini-lecture about trends in rural government policies, and a Q&A session. The day was full of new knowledge in a truly global environment. By interacting with English Village tutors from different places in the world, we hope our students will be able to think more carefully about global and local environmental and social issues raised in the seminar. We visited Sakai Minato for the final day of the SGH study trip to Tottori. 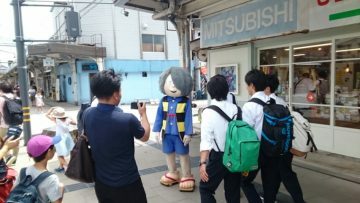 We went to see Mr Fukutome of the Sakai Minato Tourism Association to learn how they made Mizuki Shigeru Road – a street in the town lined with statues of Yōkai monster characters from the works of the manga artist of the same name. The association also have plans for future renovation and events. It was interesting to have the chance to see tourism promotion being put into action. 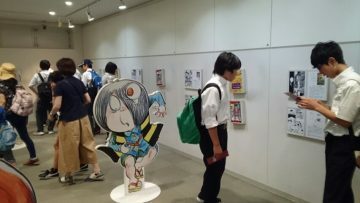 We then went for a walk together along the road, taking pictures of the statue of Kitaro, the main character of the manga Gegege no Kitaro, ending with a visit to the Mizuki Shigeru Museum. Out exploration finished here, and we headed for home after lunch. 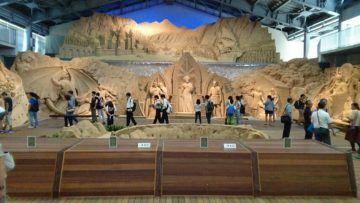 The third day of the domestic study trip was devoted to learning how to utilise landscapes such as the Tottori sand dunes and the Geo Park, in which the sand dunes are located. 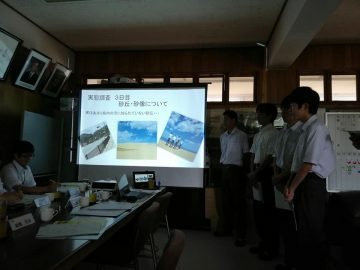 To begin, we received a lecture from Mr Yamane of the Sand Dune Tourism Association about their strategy, event organisation, and future plans for tourism promotion. 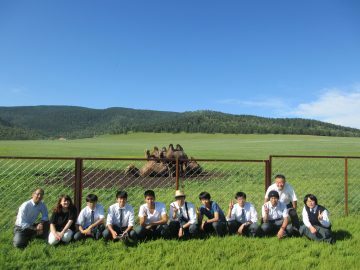 Then we visited the sand dunes and saw Horse Back and Oasis, which were mentioned in Mr Yamane’s presentation. There was also a sand sculpture made by local secondary school students over the summer. 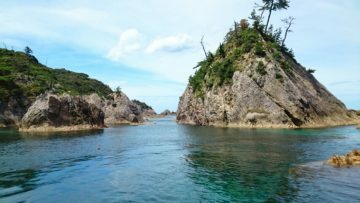 The next destination was the coast of San’in Matsushima, the other part of the Geo Park. We saw the rugged seashore from a touring boat. 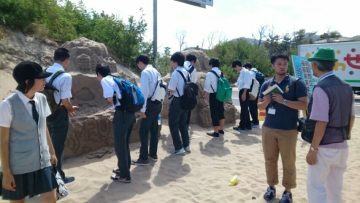 In the afternoon we visited the Sand Museum, where we were shown around by staff member Mr Shimozawa. He revealed a great deal about the works of the museum, talking about its 11-year history, its present, and its and future plans. This fabulous introduction allowed us to enjoy the museum even more thoroughly. 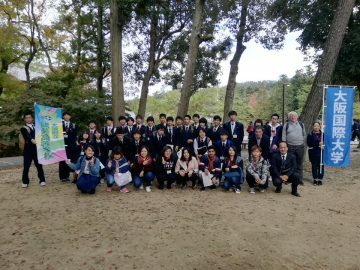 The first three days of the study trip were made wonderful thanks to the efforts of our coordinator, Prof Nakahashi of Tottori University of Environmental Studies. Activities for the second day started with a visit to Kyoichi Kitano, the head of Amanjaku no Kai. 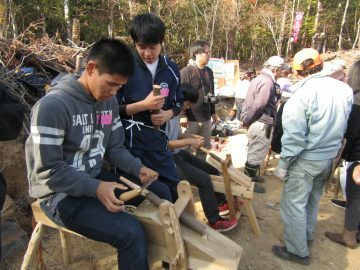 Amanjaku no Kai is an association providing improvement plans for villages, and the organiser of Kougei no Sato (the Village of Craftwork), a place for local craftworkers. 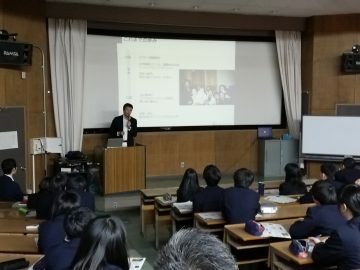 A member of the organisation, Mr Kitamura, who moved to the Saigo district of Tottori from Minoh 10 years ago, talked about his years of locally-oriented activities with videos and presentation slides. After that, we visited four potteries in Kogei no Sato to learn about their work. We met Mr Maeda, who is an experienced Dehua porcelain maker and whose skill is designated as a national intangible cultural property (a designation known as ‘human national treasure’! ); the members of the Inshu Nakaigama kiln, who have been collaborating with industrial designers while keeping traditional methods alive; the staff of the Ushi-no-to-yaki kiln, which draws from a simple folklore-style pottery tradition; and the members of the Karin Gama kiln, which was found just one year ago. The head of each of the four kilns is passionate about polishing their skills and working with their own philosophy and style. This sets them apart from mass-production potteries. In the evening, we visited Tottori prefectural office again in order to meet the governor Shinji Hirai. We had 25 minutes to interview him; it was a short time but Governor Hirai was friendly and eager to help our curious group of students. We also had a chance to talk to several prefectural officials. It was an interesting experience for us to meet an active politician and officials who are dedicated to improving rural areas. 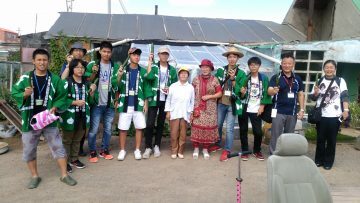 On 20th August, the first day of our domestic study trip for the SGH programme, we arrived at Tottori University of Environmental Studies around 1pm. We were welcomed by Prof Nakahashi, who used the example of Tottori Prfecture to explain about the unique features of local areas. Next was our turn to give presentations about the purpose of this study trip and plans we had come up with for local revitalisation. We were asked questions about the use of bio-diversity and the mechanics of games suggested in our plans. In the evening, we visited Tottori prefectural office to hear an explanation of local government around rural revitalisation. 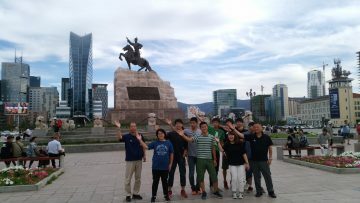 On the second-last day of our overseas study trip, our first destination was Save the Children Mongolia. Ms Gereltuya and the staff welcomed and showed us around. We gave our English-language presentations about our research on poverty. The staff appreciated that the presentation included real consideration of the living situations of Mongolian children. The content bore some resemblance to some of the charity’s projects. We left Save the Children for Zaisan Tolgoi, a famous tourism spot. We were rewarded for our 600-stair climb to the hilltop with spectacular views of the surrounding scenery. While learning the history of this place, we also had the chance to experience holding a eagle on our arms. Next, we visited Tatuka Bakery Cafe. The cafe is run by Mr Telmen, the vice chief of Magic Land – the NGO that we visited yesterday. A previous group of students from Nose had learned about Mongolian beekeeping from him 2 years ago. A part of the profits from the cafe goes to support projects for children. We ordered drinks and cream puffs, and listened to a talk by Mr Bazarsuren, who grew up as a nomad when he was a child. He knew a lot about traditional children’s games and the nomadic life. Then, Mr Telmen gave us a mini-lecture on beekeeping. We had already briefly studied beeping during our SGH classes, so this was a good opportunity to gain a deeper understanding of the subject. 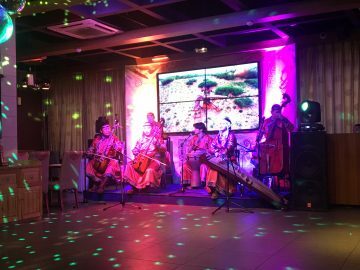 In the evening, we were treated to a performance of music and Tumen Ekh – a traditional dance – and went to Sükhbaatar Square for a history talk given by our guide Gantuya. 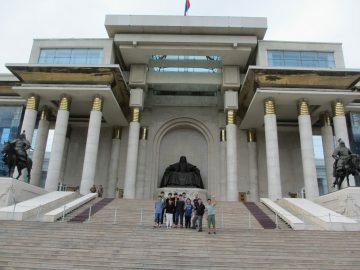 We took pictures with the statues of Damdin Sükhbaatar and Genghis Khan in front of the Government Palace. We felt the tides of internationalisation coming to Mongolia at dinner: it was a Chinese-style shabu shabu dish. It was also interesting – and refreshing, after all the heavy topics of the trip – to hear about Mongolian youngsters’ lives and perspectives from Gantuya, who is a student of economics at a local college. Today’s first destination was Rajiv Gandhi Polytechnic College of Production and Art. On arrival, students from the college showed us around the exhibition space, where we saw traditional stone sculptures and metal carvings. We were welcomed by the college’s principal Mrs Bayarkhuu Gairan and a group of four staff members and nine students. After Mrs Gairan’s introduction of the college and a few words from our vice Principal Ms Uchida, our students gave English-language presentations introducing Nose and talking about social issues surrounding poverty. This was followed by individual introductions by all present, and discussion of the themes of the presentations. Students of the collage were majoring in fashion, grooming, contemporary art and computing. Some of them want to study in Japan in the future. We also exchanged gifts: we gave them grape jam produced in collaboration with Vegetable Park, and they gave us Mongolian dolls which they had made. After leaving the college, we headed for Magic Land, a facility set up by an NGO to shelter children who need salvation from abuse or poverty. We were guided around the facility and heard an explanation about the NGO’s activity, did some aerial photography, and taught children at Magic Land how to hand-knit wool into misanga bracelets. Including the adults, there were around 20 participants. Some children made several misanga bracelets to give to their siblings. After the wool workshop – and a bit of an impromptu origami lesson – we said goodbye to the children, and delivered our presentations on Nose and poverty for the staff. We had good time with them, as well as with the children, and they were kind enough to give some useful feedback on the presentations. Mr Telmen, the vice director of the NGO cared for us while our visit, was particularly helpful. He showed us around the main office, the temporary shelter, and the counselling room. We gave him grape jam and honey produced at Nose High School as by way of a thank you. We ended the day with traditional Russian cuisine – Borscht and home made cake. 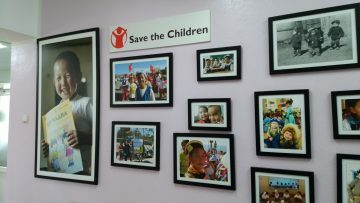 Tomorrow, we will visit Save The Children’s Mongo-lia office. In the morning of 7th August, the temperature dropped rapidly around 2-3am like Japanese late autumn, and it gradually became warmer when the sun started rising and we woke up. We were amazed at the spectacle of the scenery of the fields lit by the morning sun. 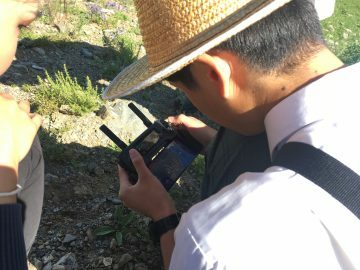 We ate breakfast, and took advantage of the beautiful weather to take some more aerial footage with the drone, before departing for Ulaanbaatar. Along the bumpy two-hour drive to Ulaanbaatar, we encountered herds of cows and camels. We took many pictures of them, including some using the drone. The first thing we did in Ulaanbaatar was to pay a visit to Gobi, a famous shop run by the adjacent cashmere factory. We collected cashmere product price data, and observed how popular this shop is – likely because it deals in the finest quality goods sourced directly from the factory, and sells them at a reasonable price. Lunch for the day was at a Mongolian barbecue restaurant, where we enjoyed grilling the meat ourselves. Prof Imaoka from Osaka University School of Foreign Studies joined us at the restaurant. She is going to be supporting our trip, explaining Mongolia and its culture along the way. Her expertise and experience in the field will be invaluable in shaping and guiding our research. After lunch, something unexpected happened: we visited the Mongolian Government’s Committee on Children Rights, but there was nobody in the office. Prof. Imaoka contacted the Mongolian consulate in Osaka, who had helped arrange the visit, and received an apology and a promise that they would follow up on the matter from the consul general. We changed the original plan and headed for a department store and a woollen goods shop which we had been planning to visit on the final day. The owner of the wool shop has connections with the Tolgoit Community Development Center we visited on Day 3, and he is teaching children to make felts. The various types of woollen products there showed us the versatility of the material. At the department store, students bought gifts and souvenirs for their family and friends. At the end of the long day, we checked into Flower Hotel, had a lovely Mongolian dinner, and had a good rest ahead of the next day’s visit to Rajiv Gandhi Polytechnic College of Production and Art. The third day of our overseas study trip started with a visit to Tolgoit District Third Khoroo, where Tolgoit Community Development Center (TCDC) works on community support. The Third Khoroo has reputation as being progressive for the local children’s support activities in cooperation with TCDC. Nose HS members were welcomed with a music performance by the community band formed with long-term charity support from our school. That was followed by an introduction of the members of the Third Khoroo and TCDC staff, and instruction on khoroo administration at their ger office. Our students then gave their English-language presentations on Nose and on their research about poverty, and answered questions. 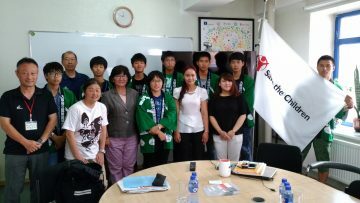 They also interviewed Mongolian staff about TCDC activities and social issues related to their research. When the students finished the visit and left the office, children from the programme ran the previous day’s activities were waiting for them. They had brought spindles for our students to sign. The students were happy to meet their Mongolian friends again, write on the spindles they made together, and take more photos. The next visit was to a household located in the Third Khoroo to learn about their daily life. The students were shown around the house and the garden farm. The family earns some income by selling cucumbers and other vegetables from the garden, and they were kind enough to gift us with some cucumbers. 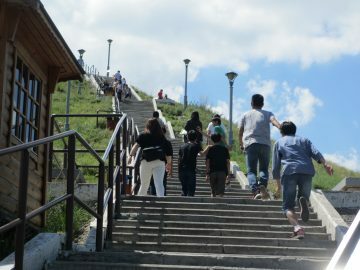 After lunch in Ulaanbaatar, we headed for Nuuts Tobchoo camp – a tourist ger campsite and our accommodation for the day. The bus ride took two hours through the middle of a large field with a stop-off at a shop inside a ger selling Kumis, a traditional drink made with fermented horse milk. At the ger campsite, the students captured the scenery with the drone, and enjoyed horse riding. They were nervous and excited about their first time on a horse! We also went strawberry picking in the forest. After dinner and a debriefing in the evening, we were blindsided by the beautiful spectacle of the starry sky. The moon was not very bright, so we could see constellations, shooting stars, and even make out the Milky Way for good measure. 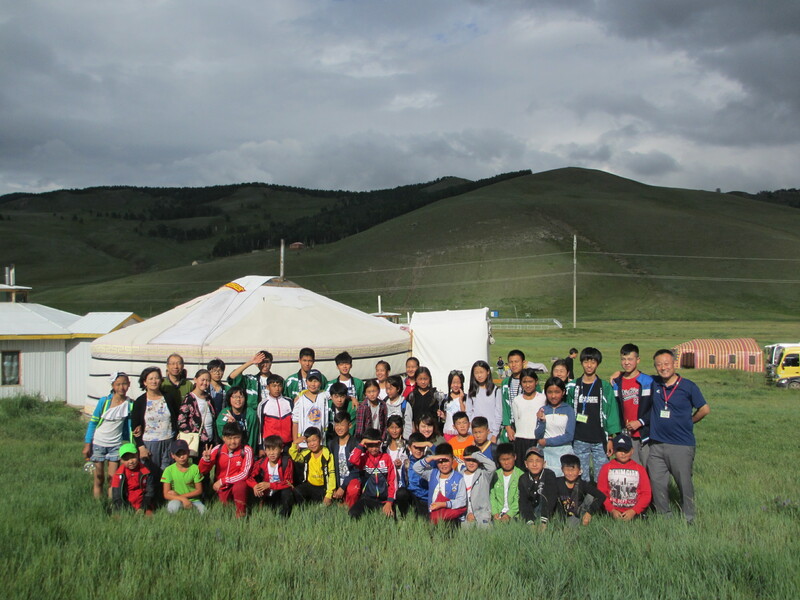 On 5th August, the second day of our overseas study trip, the students visited a campsite in an area with gers in northern Ulaanbaatar. Even the journey there was an adventure! The bus went slowly on the unpaved, bumpy road. We stopped by a water collection spot where cold and clean ground water comes up, drank the water, spoke with local people fetching water, and helped them to carry water tanks. Once we arrived at the camping site, we joined people with the programme ‘Community Kids Camping’ organised by Tolgoit Community Development Center, a local NGO. The eight SGH students gave presentations in English about Nose and their research topic of poverty for 32 Mongolian secondary school students and 9 community staff members. They also enjoyed the Q&A session, receiving many good and critical questions from the audience. 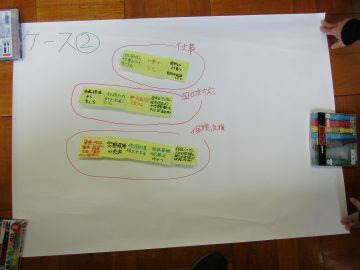 The session was very multilingual, with constant interpretation between Japanese, English, and Mongolian. Following this, the Mongolian students delivered performances demonstrating their tradition, culture, and daily life. 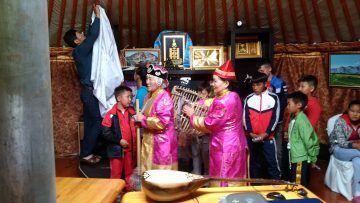 At the end of the programme in the morning, the Nose students handed the donations collected at last year’s school festival charity fundraiser to the community members, receiving Mongolian gifts in return. At the break time after lunch, students had some fun with local children, playing soccer, volleyball, tag, and trying some Mongolian wrestling. Everyone was excited about seeing the aerial drone photography of the vast fields. Afternoon activities started with a wool spinning workshop. Our students taught the others how to spin with material such as plastic bottles or cardboard, using knowledge they had learnt in the SGH classes. While it was difficult to communicate through verbal language alone, they made best use of gestures. In return, community members taught us wool felting and how to make key charms using felt. Time passed rapidly, and we soon had to part with the warm-hearted locals. We took some group photographs as a memento. Dinner this evening was Mongolian-style Chinese food. 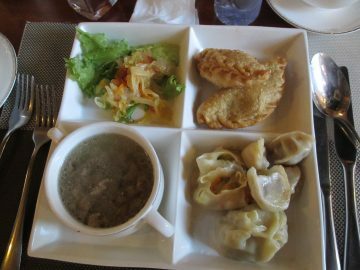 Today, we experienced not only cross-cultural communication, but also how good Mongolian mutton and lamb tastes. Everyone’s plate was clean by the end! 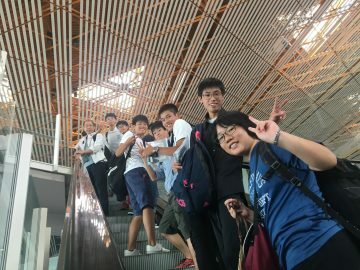 On 4th August, eight second year students from the Super Global High School class departed for their overseas study trip to Mongolia. Our principal and a few teachers saw them off from Nose HS, departing at 6am. 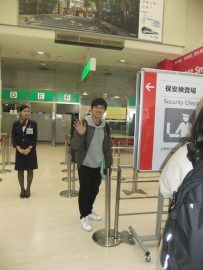 They arrived at Kansai International Airport at 7:30 and boarded the plane at 8:30. Their journey had begun! 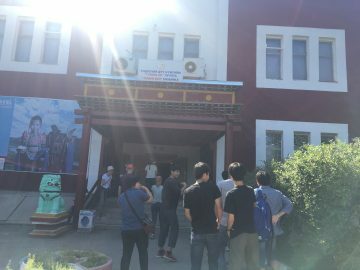 After a surprisingly rigorous security check at Beijing Airport and four hours of waiting for their transfer, the students arrived at Chinggis Khaan International Airport in Ulaanbaatar at 5pm. Students received some Tugrik – the local currency – and went to buy food and drink at Emart, a supermarket. Outside was still light around 8pm when they finally arrived at the lovely four-star Chinggis Khaan Hotel. We then settled in to rest before for tomorrow’s activity at Tolgoit Community Development Center. 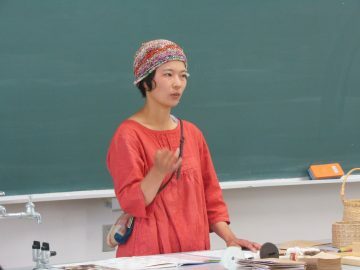 After school on the 19th of June, we held the Second Year’s 15th SG focused-area lecture, welcoming Matsurika Matsuoka of Kesera-kobo Watambo to deliver a spinning workshop. This was the second in the series of three workshops; this time, we learnt about natural dye using plants. Plant dyeing is a method of dyeing clothes and threads using natural material such as grasses and tree skin. 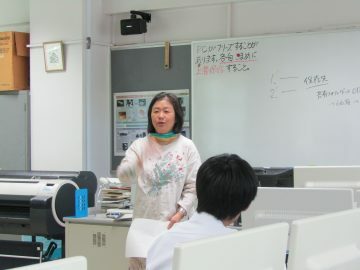 Ms Matsuoka told us that in Japan, it likely has 6000-8000 years of history. 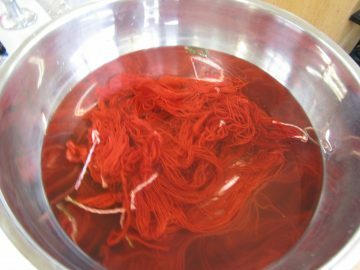 The procedure involves cleaning threads, a first dye by boiling threads with dye materials, and ‘mordanting’ – using a catalyst to let the colour become fixed. For this workshop, we were using a red dye made with Indian madder. The colour is made by boiling dried madder roots for 20 minutes, sieving the water, and then adding and boiling the threads – the same ones that students spun themselves at the last workshop. In 20 minutes, the thread obtained a vivid red colour. The students seemed to admire the natural ability of this plant. In addition to the technical aspects of the dyeing process, Ms Matsuoka told us about how dyeing and colour has influenced Japanese traditions and culture. We will learn more about the relationship between traditional craftwork and nature on our domestic and overseas study trips, discovering what traditions different groups of people appreciate and pass down through the generations. 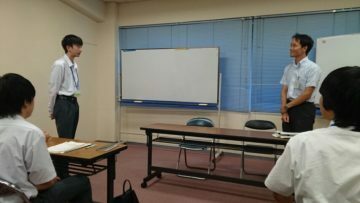 During the SGS class on 21st June, we held the Second Year’s 14th SG focused-area lecture with Prof Ryoko Imaoka of Osaka University and three staff members from Nose Town Hall Welfare Section of the Health and Welfare Department. The topic of the first half of the day was why food producers became unable to make living, with the example of Saito Farm in Tanto Town in Hyogo Prefecture. 90% of the land in Tanto is mountainous, as is true of many Japanese rural municipalities, and they have difficulties in making a living because they cannot generate enough income. Though a little livestock and a few rice fields were sufficient before WWII, agricultural households fell into hardship because of rapid Western-style modernisation led by the government after the war. Modern agriculture in the style of the West requires mass production. As a result, farmers who could not make ends meet financially left rural areas to work in urban areas. Prof Imaoka will continue this topic on her next visit. In the latter half of the class, members of Nose Town Hall Health and Welfare Department gave a lecture with the theme “Aiming for an all-inclusive society: the state of citizen welfare in Nose”. Mr Oue and Mr Kikuchi started with statistical data such as population demographics and poverty rates. This revealed that the relative poverty rate of Nose Town is 17.0%, which is higher than Osaka Prefecture’s average of 14.9%. Therefore, children tend to fall into poverty. 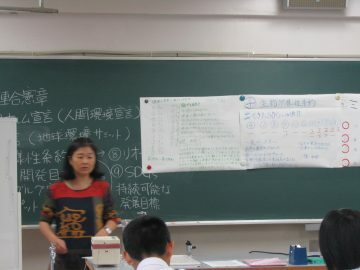 Research titled “Investigation into children’s lifestyles and life quality”, conducted among elementary and junior high school students in 2016, illustrates that various family issues and fewer social connections within an area are likely causing of a decrease in the usefulness of home education. For tackling those kind of issues shown by the census data, Nose Centre of Health and Welfare established a section to support the future of children. Some schools have also set up a place kids can go even during the summer vacation, offering supervision, interaction, and meals. To conclude, Mr Hanasaki talked about the issue of Japan’s ageing population and low birthrate. Nose is not the exception to this nationwide problem. To combat this, he encouraged strengthening mutual-support networks to create a more all-inclusive society. We are going to include the content of this lecture concerning issues and measures in Nose in our presentations for our domestic and overseas study trips. 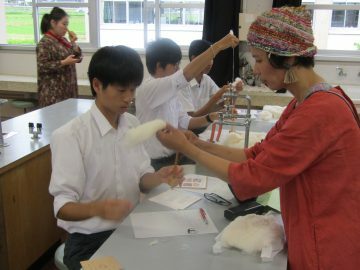 After school on the 19th June we held the Second Year’s 13th SG focused-area lecture, welcoming Matsurika Matsuoka of Kesera-kobo Watambo to hold a spinning workshop. This was the first in a series of three workshops. To begin, Ms Matsuoka introduced herself. 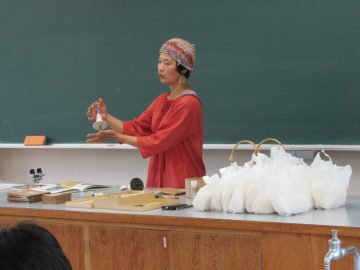 Her life experience is versatile: she studied at the vocal music course of Osaka College of Music, worked for Billboard Osaka – a famous venue for jazz performances – ran a Okonomiyaki restaurant, and then came across the Fukuoka method of natural farming, moved to Nose, and started cotton farming to make basic and essential garments. She is currently running the workshop Watambo to teach spinning, weaving, and dyeing with organic cotton so people can learn how their clothing is manufactured. In today’s class, we started by making our own spindle. We used knives to shave pencil-length pieces of wood, polished them with sandpaper, and used them to make our own threads. It was hard at first to spin a loaf of cotton into threads, because we could not keep the threads robust and fine enough. 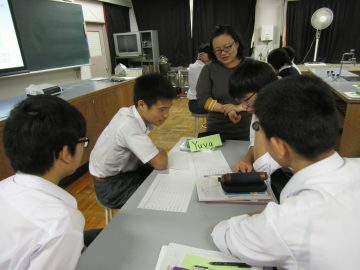 After 30 minutes’ practice, the students improved their skill enough to manage to make a long thread without any cuts. In this world of the division of labour, we don’t have a lot of chances to make our necessities by our own hands. Making threads from raw cotton at this workshop was a great insight into standard manufacturing processes. In the next session of the series, we are going to dye the threads we made today. 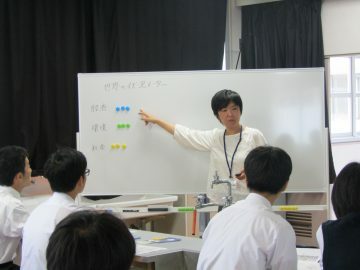 We held the Second Years’ 14th SG focused-area lecture in the morning classes on 15th June. Prof Imaoka and Ms Enebish from Osaka University paid us a visit to help students improve their presentations that they will be delivering on their domestic and oversees study trips. They also gave some advice related to previous lectures on Mongolia. Prof Imaoka mentioned the possibility of self-employment-style production because it could overcome issues caused by unstable economies. 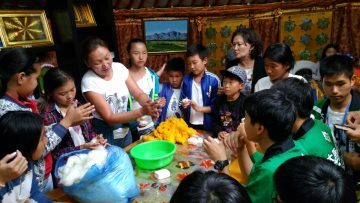 Ms Enebish added the real-life example of the third Khoroo (the name of a type of district in Mongolia) holding workshops on making wool-felt slippers in order to create their own income. Students will continue developing their presentations using the tips they got in this class. 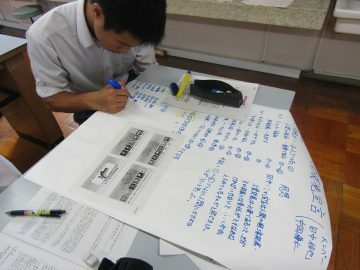 We held the Second Years’ 12th SG focused-area lecture in the morning of Saturday 13th June. 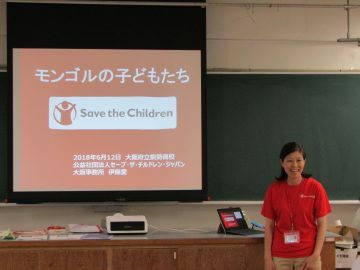 Delivering the lecture was Ms Ai Ito of the Ōsaka branch of Save the Children Japan (SCJ). Founded in the UK about 100 years ago, Save the Children has been working in 120 countries supporting children in need. Today, Ms Ito focused on their activities in Mongolia. 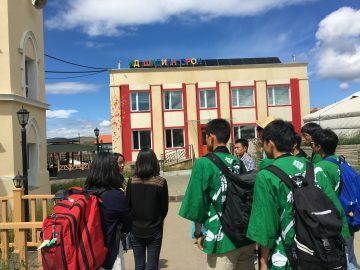 In Mongolia, where children are 30% of the population, and 30% of the population live spending under 3 dollars per day, SCJ has programmes which deliver textbooks to support the home-schooling of nomadic children who cannot commute to nursery schools, and runs after-school classes and mental care facilities for elementary school children living in dormitories separated from their family. Following the talk, we moved on to a workshop based around planning a project to support nomadic children hit by Dzud – the severe Mongolian winter – and how to enable them to get to school. 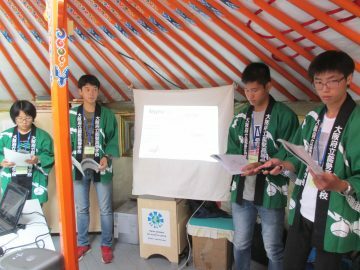 Students, imagining themselves as volunteers of SCJ in Mongolia, suggested the creation of a combined farming- and goods-production business, or of supplementary classes based on Terakoya (a traditional grassroots teaching system). However, the students definitely recognized the difficulties of conducting projects within the limitations of fund and labor force. Ms Ito emphasized that we need to both realize our own position and how we can best contribute from it, and that we should talk and distribute information to raise awareness around tackling social problems. This lecture will help students develop the skill to analyze situations from their own perspective during the study trip to Mongolia in August. On 7th June, for the Second Year’s 3rd SG basic knowledge lecture, we heard from Khaofang, this year’s exchange student from Thailand, and Iori Ōki, a second year student who went to the Philippines for short-term study. Khaofang gave a presentation on Thai food, festivals, sightseeing spots, his friends and school, and the difference between life in Nose and in his home country. We were surprised to hear that the official name of Bangkok is the longest city name in the world. 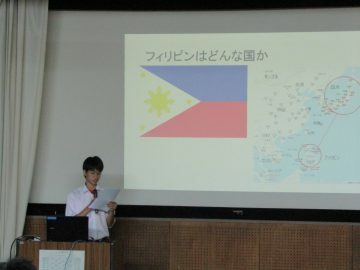 Iori’s presentation was about his two-week study abroad experience in the Philippines and the culture shock he encountered there. 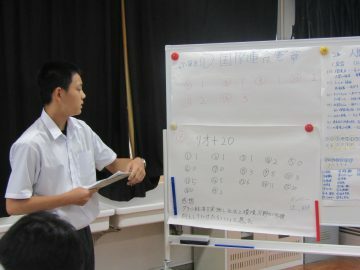 He took part in the programme because he was curious about the world outside of Japan, and wanted to improve his English. Even though it was short, the stay removed his hesitance to speak in English. It was a shocking experience for him to see homeless children begging for money on the street. However, he enjoyed the is a beautiful sea, affordable prices and decent levels of safety depending on where you stay. The trip made him realise how privileged our life in Japan is; many people in the world don’t have the chance to live like we do. The two students’ stories about their cross-cultural experiences seemed to have inspired their classmates. The Second Years’ 9th SG focused-area lecture was split into two sections. First, our agricultural technician Mr Wakitani delivered a lecture about beekeeping of European honey bees. His introductory lecture with slides full of pictures and data gave us comprehensive information on six crucial factors of beekeeping: beehive checking; ensuring the availability of nectar-source plants; raising new queen bees; honey collection and the making of by-products; the annual work schedule of beekeepers; and the ecology of bees. We learned the surprising fact that 11% of all animal species around the globe are classified in the same order as bees and ants. 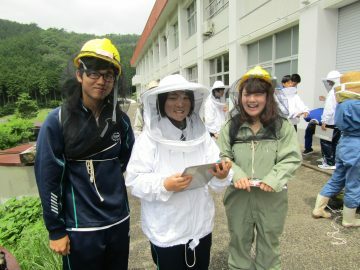 Mr Wakitani also talked about beekeeping in Nose Town and Nose High School. 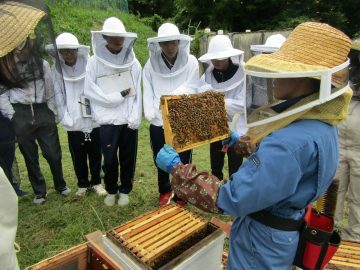 The latter half of the class was held on the site of the school’s beehives, and was led by Ms Matsuda of the Agricultural Department. Wearing protectors, we started with the beehive check. It requires checking the condition of the queen bee, male bees, and working bees, and maintaining the hive accordingly. On the day of the lecture, the chestnut trees around the school were in full bloom. We enjoyed the smell of the blossoms, and even got to taste them during the honey tasting at the beehive site. The basic knowledge on beekeeping we learned in this class will be helpful at our study trip to Mongolia in August. Why, it’s a ton of bees! The Second Year’s 8th SG focused-area lecture was a delivered by Mr Toshiyuki Saito. 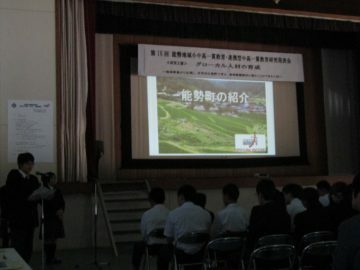 The theme was the vitalisation of rural areas in Japan and abroad. Mr Saito is working as a member of a rural vitalisation project led by the Ministry of Internal Affairs and Communications (MIC). The core of the lecture was empowerment of local residents with usage of local products. Currently, 30% of the population of Japan is concentrated within urban areas. Many rural districts are troubled with decreasing population. Mr Saito talked about how a more lively countryside could boost the country as a whole, discussing his own experiences working in Costa Rica. He lived there for a year at the age of 26 before coming back to Japan and starting his company. He has been thinking about entering the whisky business, and recently visited Scotland to learn about the production process. He has a vision for Nose town as the home of a distillery, with rice production being supplanted by fields growing the barley needed for the spirit. According to Mr Saito, the most important thing for each individual is to find what their potential is and know what they want to achieve. 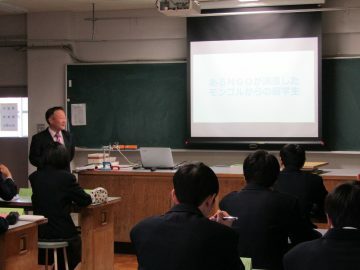 He recommended that our students use their high school days to think about what they will be able to become in the future, and to go abroad in their 20s to broaden their horizons rather than trying to earn a lot of money at home. Mr Saito intends to empower people and have them vitalise their local area by their own hands. Our students seemed to be thinking about what they could do for Nose, a town suffering from the nationwide affliction of a shrinking population. 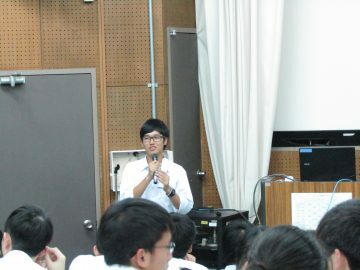 We held the second year’s 7th SG focused-area lecture in the morning classes on 31st May. 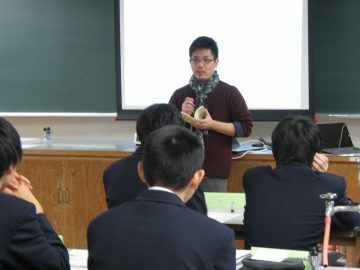 The guest lecturer was Ms Sayuko Matsumura, staff member of Minoh-based NPO Kurashi-zukuri Network Kitashiba. 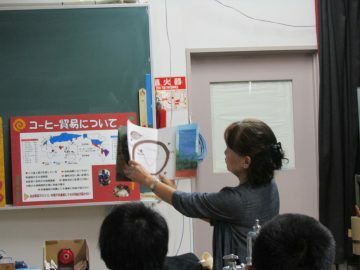 She is working to tackle issues in the city including poverty; her lecture was aimed at understanding poverty in children in Japan. She started with a group workshop to help the students understand costs of living. Students calculated and presented one month’s worth of expenses considering differing locations, annual income, number of family members, rent or mortgage payments, and food outlay. These calculations revealed a high rate of relative poverty in the Japanese population. Relative poverty, a useful index for understanding poverty in developed countries, shows the number of people who manage to survive but cannot achieve a standard lifestyle in their local area so whose children tend to give up what they want to do. 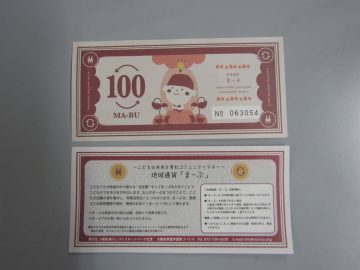 Ms Matsumura, her coworkers, and local volunteers are offering a 『Kodomo-Shokudo service』 (a free children’s cafeteria) and issuing Maabu, a local currency in Minoh especially for children in order to enable them grow up without being limited by the environment into which they are born, and to be free to make their own choices in life. Her talk about local projects was inspiring, and helped us think about some methods of tackling poverty. One in every six children in Japan are reportedly living below the poverty line; it is more than just a problem for other people to face. Second Years’ English-language presentation lecture has begun! 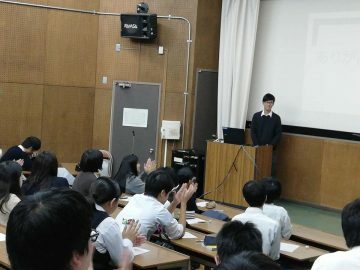 24th April saw the beginning of the Second Year’s English presentation lecture series. Throughout this year, we are delighted to welcome as our teacher Ms Naoko Nadtochiy. The very first class was all about learning what a presentation is, and about how to present ideas effectively. For our first practice, the students tried to introduce themselves in English and discuss what is important in an introduction. Ms Nadtochiy had them think of a catchphrase to describe themselves in order to grab the audience’s attention. In the next class, students will deliver their improved introductions, with their catchphrases included. 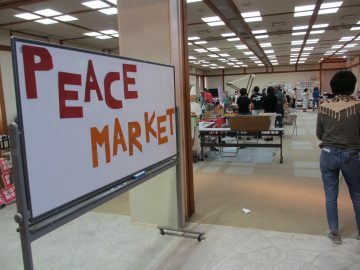 On 20th May, eleven of our First Year students from the Global Studies research project lecture attended the Peace Market Nose 2018 held at the Jo-ruri Theatre. They arrived at 8:30am to assemble a Mongolian ger, and set up the poster exhibition presentations about Nose High School’s SGH and other international activities. The market started at 10am. Our students volunteered as film screening ushers, and spent time talking to staff from several booths about their motivations for participating in this market, asking their impressions of Nose, and receiving messages for local school students. Everyone was very kind and generous enough to give answers despite their own workloads. We also found time to discuss some of the achievements of the Second and Third Year SGS students, and of graduates of the program. Some of the visitors were very interested and seemed keen to ask us questions as well. 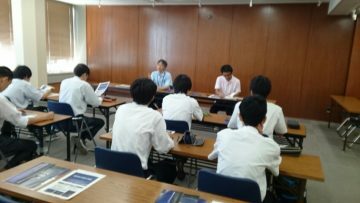 For the First Years’ Global Studies project-research-introduction lecture held in the 5th and 6th lesson periods of Thursday 17th May, we were delighted to have as a lecturer Mr Kotaro Kawamata. Mr Kawamata is currently working as a counsellor at the Japanese Embassy in Germany. The theme of the lecture was community revitalisation and energy-source conversion by an energy company local to the Nose area. 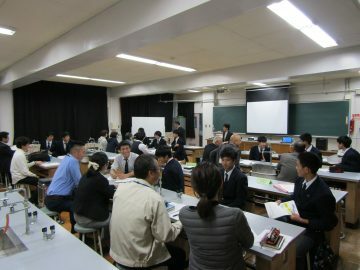 It was the third GS class for the First Years, who spent the first two classes learning basic skills and knowledge needed for this lecture series, such as note taking, putting opinions onto paper, basic information about Germany, and issues surrounding the global environment and energy security. We were joined by a large audience from around the area, and even a TV crew. Mr Kawamata started by discussing the Paris Agreement, and expanded the topic from there into sustainable energy more generally, talking about wind, solar, and other sources of renewable energy generation. In his comparison of Japan and Germany, we learned that Japanese usage of renewable energy remains at 14.8%, while Germany has already reached up to 33% and has announced a plan to close all nuclear power plants by 2022. He also pointed to ‘Stadtwerke’ – a kind of municipal third sector on energy – which is helping to stimulate local economies by purchasing electricity generated by local businesses and households, thus reducing the burden on public energy infrastructure and increasing employment. Group discussion on the lecture followed. Six groups of students discussed if Nose should increase the rate of renewable energy, and how it might do so. They came up with a range of ideas, including a suggestion to generate electricity from the heat emanating from hot springs, a plan to use biomass derived from forests, and a programme to educate residents on the possibilities of sustainable energy in the household. 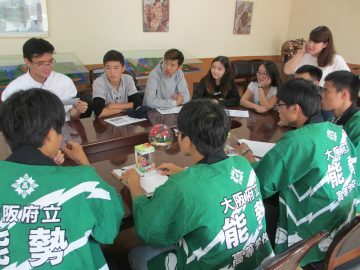 The students seemed to have seen the potential of sustainable energy in a town like Nose with its shrinking population. Our students will have a study trip to Germany along with members of Nose Town Hall. This lecture was a great introduction to the study program that they will be partaking in for the year. Second Years’ 3rd Super Global focused-area lecture – fun with students from Korea! 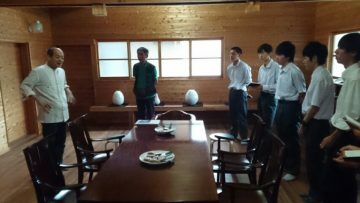 On 14th May, we were visited by 38 Second Year students and three teachers from Dong-Ah Meister High School in Daejeon, South Korea. Approximately 30 Nose HS students from across every year group came to the AV theatre room after their classes had finished to meet and chat with the visitors. 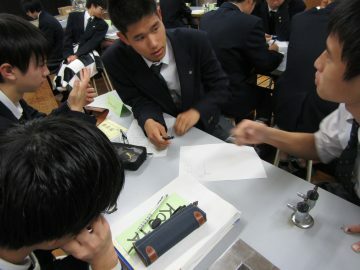 The government-run Meister High School system in Korea aims to raise a generation of industrial technology experts by creating and supporting technical high schools. The students are expected to be work-ready straight after graduation so that they can join local tech giants like Samsung and Hyundai, or other corporations from across the world. Our session started with an English presentation by Second Year SGH students introducing our school and the town of Nose. 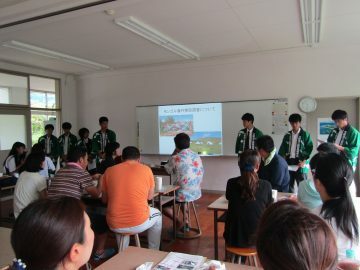 Some of the Dong-Ah students could speak Japanese so they also showed a video and made a presentation introducing their school. 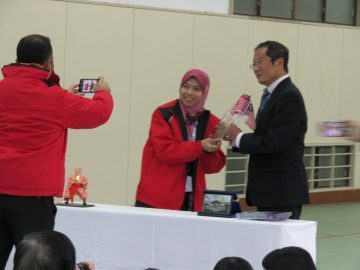 After the presentations, the president of the Nose High Student Council gave a speech and exchanged gifts with the Korean students, and there was time for students from both schools to mingle. There was an interesting mix of different languages and communication methods being used, both directly or through Dong-Ah Meister’s interpreter, and with gesture games facilitated by our Third Year SGH students. Time passed very quickly; everyone seemed to wish they had longer to spend with each other. 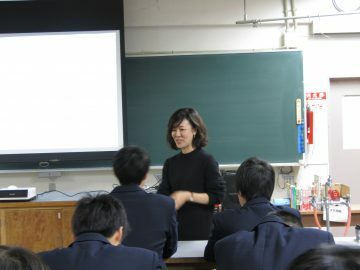 For the SGS class on 10th May, we welcomed Ms Enebish, a Mongolian postgraduate student at Osaka University Graduate School of Language and Culture, to talk about causes of Mongolian child poverty. In 1980, during Ms Enebish’s childhood, Mongolia experienced a drastic change in its economic circumstances and a lot of citizens fell into poverty. 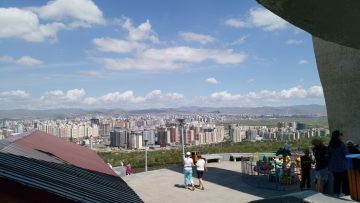 At the same time, a massive snowfall damaged the lifestyles of nomadic peoples, and they were forced to settle in inconvenient residential conditions in the urban area of Ulaanbaatar. Today’s lecture included case studies of three different children. 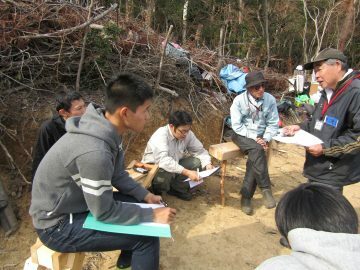 Students discussed possible solutions for each case, such as social security improvement and usage of Mongolia’s plentiful land for new residences. Ms Enebish also talked about her previous work at NGO Gender Center for Sustainable Development in Ulaanbaatar’s ger settlement area. The NGO conducts projects locally to catalogue residents’ living circumstances, and helps to relay the opinions of locals to the government. Some students will have an opportunity to visit the NGO during the study trip to Mongolia in August, so it was very helpful to hear about it from a former staff member. 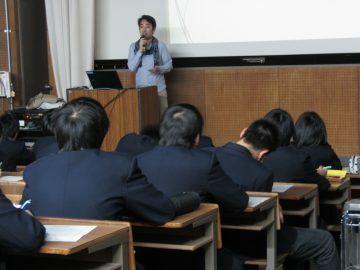 The second years’ 3rd Super Global focused-area lecture was held on the morning of 26th April. 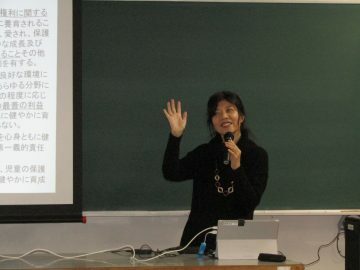 We welcomed Ryoko Imaoka of Osaka University to deliver the lecture, which was entitled “Building a self-sustaining society and mutual regional cooperation: a case study in Mongolian poverty and street children”. 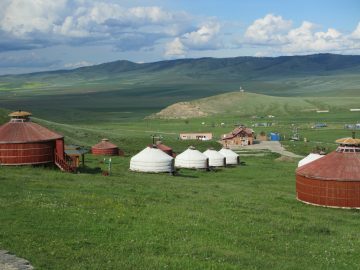 In this first class of the lecture series, students learned how Mongolia has been negatively affected by several political, economic, and natural factors. We started by sharing our thoughts from an NHK documentary which we had watched the previous week. The documentary was about homeless children in Mongolia who live in the sewers, known as ‘manhole children’ in Japanese. Students shared their shock and the complicated feelings brought about by the video. There was a running trend which saw the students focus on the suffering of innocent children. They couldn’t justify or accept that such suffering be brought about by the collapse of societies and families, leaving the children as victims at the end of a chain of economic failure. The emotional impact of the video had captured their attention, and we moved to the analytical part of the lecture. 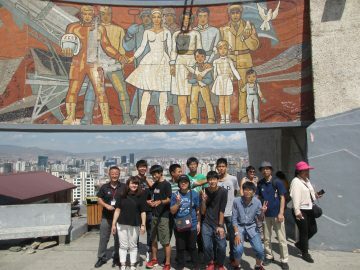 After studying the historical timeline of Mongolia as a nation, we formed groups to research imports and exports between Mongolia and the USSR in the Soviet era. We soon realised that poverty in Mongolia was partly caused by diminishing trade with the Soviet Union and domestic commodity price rises. At the time, Mongolia was importing most of its machinery and electric appliances; producing these goods within the country could be a key to economic growth. Thanks to their self-sustainable livestock-based lifestyle, nomadic people were not damaged by this economic and material crisis. However, natural disasters would impact them and their rural economies. Our students will work on this topic through this school year to understand how poverty became endemic in the community, and to think about how it could be solved. The Second Year’s SG Focused-area lectures have begun! It’s been three years since we first started the Super Global program at Nose High School. This year, the Second Year’s SG focused-area lectures will be held mainly during the Super Global Study classes on Thursday mornings. 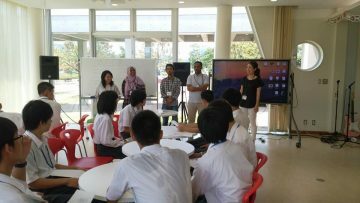 Three teachers will supervise the classes – Togashi and Ichihashi of the English Department and Tanaka of the Japanese Department. 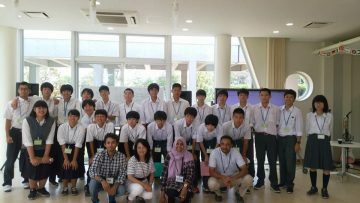 We have fourteen Japanese students taking the class, as well our Thai exchange student Kaofang. 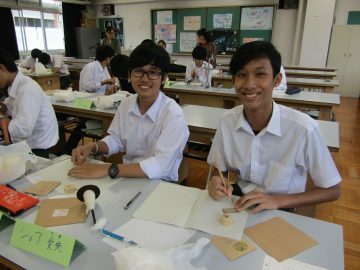 The first SG class for the second years was held on 12th April. Nose HS vice-principal Mr Uchida delivered an orientation session explaining SGH activities. We then had a discussion about poverty by way of an introduction to the upcoming lectures which will deal with social issues. 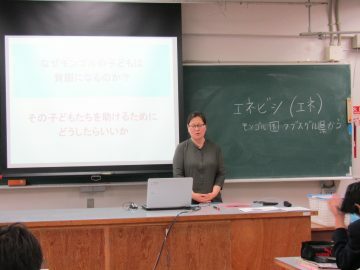 One of our diverse group of lecturers will be Ryoko Imaoka, associate professor of the Mongolian language at Osaka University School of Foreign Studies, who will facilitate discussion on building a self-sustaining society and local mutual cooperation using the example case of poverty and street children in Mongolia. While learning about topics from around the world and nurturing a global perspective, these classes aim to enable students to apply their knowledge to local issues in our own municipality of Nose Town. We believe that an individual with a ‘glocal’ viewpoint – that is, both global and local – can truly contribute towards creating a better society.